When a musician of the rank and status of Roger Woodward decides to record Bach's complete Well-Tempered Clavier at the age of 65, one could see a symbolic connection here, keeping in mind that Bach passed away at 65; the pianist senses responsibility for the continuation of tradition. Moreover, Woodward sees an additional obligation to add new life to the music through his unique style of interpretation. With this, he is in the best of company indeed: It had been pointed out repeatedlysince his release of BWV 903, the Chromatic Fantasy and Fuguethat Woodward's Bach is the most exciting since Glenn Gould. However, one ought not to misunderstand Woodward as iconoclast; his understanding of Bach is minted by tradition and above all respectful, especially showing such respect to those who set standards during the first century of recording technology. Although Woodward named it 'a defining moment' when he received the first finished copies of his Well-Tempered Clavier, he hastens to point out that one has to see him as the eternal student whose search for truth in music cannot end. If one compares Woodward's reference recording of both books of Debussy's Préludes (Celestial Harmonies13279-2) with his complete recording of both books of the Well-Tempered Clavier on 5 CDs, one winds up with the identical understanding of the works albeit having traveled in opposite directions. Was it Woodward's intention to find the structure (Woodward says 'the geometry') in Debussy, taking passion as a given, so is his way to Bach the reverse: He accepts the structure as a given and embarks on the search for passion. In both instances, one receives as the result a balanced however passionate interpretation where structure and expression exist with equal rights, as should be the case in all great music. It is something like the heart of great Flamenco: The ideal and complete merging of total discipline and precision with the passion which only can give true life to music. When Woodward was searching for the 'sacred cantilena' in Chopin's Nocturnes (Celestial Harmonies 14260-2), he rests his search for a fleeting moment with the 'legato cantabile' which can only be played as such on a modern grand piano (here a Hamburg Steinway D, dating from the early 1980s). Surely what Woodward said about Hans Otte and his 48-part magnum opus 'Book of Hours' (Celestial Harmonies 13259-2) is equally true in the case of Bach: That some music doesn't open up through practice alone but ultimately only through reflection as it is philosophy in the end. 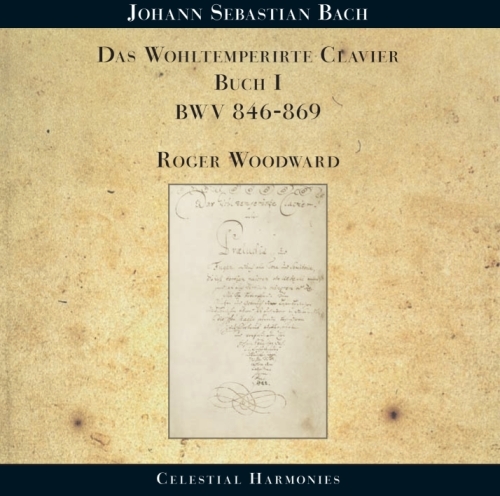 The complete edition of both books of the Well-Tempered Clavier on 5 CDs contains an 80-page essay by Roger Woodward, 'In Search of a Performance Practice', in German and English as well as the autographs of both books as high-quality facsimiles; for the first time, the lost pages have been replaced by contemporary music-set versions, based on the best available printed editions. It is thus the most complete publication of the Well-Tempered Clavier ever. Woodward hadwhenever performance issues surfacedthroughout the recording process always consulted the autographs as the first and last instance. Finally, it is the first-ever recording of an Australian musician of the complete work for international release. Wenn ein Musiker vom Range Roger Woodwards im Alter von 65 Jahren beide Bücher des Wohltemperierten Klaviers aufnimmt, dann hat das symbolisch vielleicht auch damit zu tun, dass Bach mit 65 verstarb; der Pianist fühlt sich dann in der Verantwortung für die Fortsetzung der Tradition. Woodward sieht sich gleichfalls in der Verpflichtung, der Musik durch eigenständige Interpretation ein neues Leben zu geben. Damit ist er in bester Gesellschaft. Nach Woodwards Chromatischer Fantasie und Fuge BWV 903 (Celestial Harmonies 13280-2) wurde mehrfach daraufhingewiesen, dass Woodwards Bach der aufregendste seit Glenn Gould sei. Dennoch möge man Woodward nicht als Bilderstürmer missverstehen; sein Bach-Verständnis is traditionsgeprägt und über allem respektvoll, auch vor all denen, die im Jahrhundert der Tontechnik Maßstäbe gesetzt hatten. Obwohl Roger Woodward beim Erhalt des ersten Exemplars sagte, dies sei für ihn ,,a defining moment", so ist es ihm doch wichtig, ihn als ewigen Studenten zu sehen, dessen Suche nach der musikalischen Wahrheit nie am Ende sein kann. Vergleicht man Woodwards Rererenz-Aufnahme der Debussy-Préludes (Celestial Harmonies13279-2) mit seiner Gesamtaufnahme beider Bücher des Wohltemperierten Klaviers auf 5 CDs, so kommt man in umgekehrter Richtung zum gleichen Verständnis der Werke. Ging es ihm bei Debussy darum, der Struktur (Woodward sagt ,,der Geometrie") der Werke auf die Spur zu kommen, wobei die Leidenschaft als Voraussetzung gegeben war, so ist es bei Woodwards Bach der umgekehrte Weg: Er setzt die Struktur voraus und begibt sich auf die Suche nach der Leidenschaft. In beiden Fällen erhält man als Resultat eine ausgeglichene und dennoch leidenschaftliche Interpretation, bei der Struktur und Ausdruck in vollkommener Balance und Gleichberechtigung existieren, wie es denn wohl bei jeder großen Musik der Fall sein sollte. Es geht dabei um etwas wie in der großen Geschichte der Flamenco-Musik: die ideale und vollständige Paarung von totaler Disziplin und Präzision mit der Leidenschaft, durch die Musik erst Leben erhält, in vollendeter Balance. Bei Woodwards Chopin-Nocturnes (Celestial Harmonies 14260-2) ging Woodward auf die Suche nach der ,,sacred cantilena"; mit dem Wohltemperierten Klavier geht die Suche weiter und endet vorerst mit dem ,,legato cantabile", wie es nur auf einem modernen Konzertflügel spielbar ist. Bei Bach gilt sicher auch das, was Woodward über Hans Otte und sein ebenfalls 48teiliges magnum opus STUNDENBUCH (Celestial Harmonies 13259-2) sagte; es ginge darum, dass manche Musik sich nicht beim Üben derselben öffne, sondern erst beim Nachdenken, denn es ginge um Philosophie. Die Schuber-Edition der Gesamtausgabe enthält neben 5 CDs ein 80seitiges Essay von Roger Woodward, AUF DER SUCHE NACH EINER AUFÜHRUNGSPRAXIS, in Deutsch und Englisch sowie die Autographen der beiden Partituren als Faksimile, wo bei erstmalig die verlorengegangen Teile der Autographen im modernen Notensatz - basierend auf den besten verfügbaren Druckausgaben - ergänzt sind; es ist also die vollständigste Veröffentlichung des Wohltemperierten Klaviers, die es je gab. Woodward hatte bei interpretatorischen Problemstellungen während der Produktion stets die Autographen als erste und letzte Instanz konsultiert. Roger Woodward was born in Sydney where he completed his studies at the local Conservatorium with Alexander Sverjensky; at the Music Department, University of Sydney and at the Chopin National Academy, Warsaw in the class of Zbigniew Drzewiecki. He rose to international prominence in prestigious collaborations with Olivier Messiaen, Pierre Boulez, Jean Barraqué, Karlheinz Stockhausen, John Cage, Morton Feldman, Toru Takemitsu, Richard Meale, Franco Donatoni, Leo Brouwer, Iannis Xenakis, Arvo Pärt, and has been recently working with Peter Michael Hamel, Hans Otte, Anne Boyd and Larry Sitsky. Such collaborations were recorded by the Australian ABC, BBC, French Radio and Television and by the EMI, Decca and RCA recording companies, to launch a major career as soloist with many of the world's leading orchestras including the Leipzig Gewandhaus, London Philharmonia and New York Philharmonic under such distinguished conductors as Claudio Abbado, Zubin Mehta, Lorin Maazel, Witold Rowicki and Kurt Masur, et al. As a chamber musician he is the frequent partner of the Alexander String Quartet, with whom he performed the piano quintets of Brahms and Schumann in 2009 in New York and San Francisco and with whom he will perform the Dvoøák Piano Quintet in 2010. Their recording of the Shostakovich Piano Quintet for the FoghornClassics label received brilliant reviews. At the invitation of the late Sviatoslav Richter he also performed with the Arditti String Quartet at La Grange de Meslay, Tours, and he has frequently performed at Le festival d'automne à Paris and BBC Proms. In 2009, he premiered Of the Sound of Life (a sixty-five-minute collection of twelve etudes) by the contemporary German composer Peter Michael Hamel, at the Gasteig, Munich for the Bavarian Academy of Fine Arts. His recording of this work for Celestial Harmonies was greeted enthusiastically by the German critics as was his recording of Hans Otte's Book of Hours. In 2007 he was awarded the prestigious German Critics Prize for his Celestial Harmonies recording of the Chromatic Fantasia & Fugue and the Bach C-minor and E-minor Partitas and was a previous recipient of the Goethe Prize and Diapaison d'Or by German and French critics for recordings of works dedicated to him by Morton Feldman. Current recordings for Celestial Harmonies include the Chopin Nocturnes; in 2009, the two books of Debussy Préludes were released to reviews that described Roger Woodward's performances as eclipsing those of Arturo Benedetti Michelangeli. Celestial Harmonies issued both books of J.S. Bach's Das Wohltemperirte Clavier in Autumn 2009. In the same year, he recorded music by early twentieth-century Russian composers including works by Stanchinsky, Obukhov, Roslavets, Mosolov, Pasternak and Aleksandr and Julian Skryabin. He is an esteemed pedagogue in Europe and North America, frequent member of international competitions, is resident at the San Francisco State University, School of Music, recipient of the Polish Order of Merit, Chevalier of the French Ordre des Arts et des Lettres, and a Companion of the Order of Australia.